EA DICE immerses players in the war to end all wars without sparing any of its horrors in Battlefield I. One of the most interesting aspects of Battlefield 1’s initial announcement was how oddly novel the entire concept seemed. While World War I has been covered to a lesser extent in the area of big-budget triple-A video games, there was a time that similarly paced World War II shooters were a dime a dozen. After they eventually oversaturated the market, however, publishers and developers brought their settings up to speed and continued leaning toward a more futuristic take on the genre. That’s why—especially in a year in which we also got Call of Duty: Infinite Warfare, aka Call of Duty IN SPACE—Battlefield 1 comes off as especially necessary. 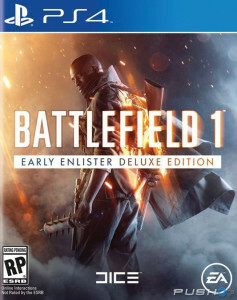 With that in mind, EA DICE could have easily just dialed its aesthetic back a century and called it a day, leaving it up to the players to breathe life into The Great War. Instead they opted for a more personal approach, crafting a series of “War Stories” that make the single-player campaign a sturdy pillar of the overall package. Rather than having players progress through various stages of the war in a linear fashion, these War Stories bust out the microscope to focus on individual human beings. Considering how impersonal war games can be, this is a refreshing take on the subject matter, and it doesn’t flinch at the horrors of battle or attempt to hide how cruel and arbitrary combat can be. One of the first War Stories has players stepping into the role of a British tank driver named Danny Edwards. Together with his crew he attempts to navigate a Mark V tank nicknamed Black Bess through enemy territory, resulting in a mix of intense in-tank combat and stealthy ground missions. In the case of the latter, Danny occasionally has to leave the tank to either clear the area ahead on foot or, in one particularly exciting segment, sneak through an enemy encampment to steal components for tank repair. Battlefield 1 is all about atmosphere, so these areas all have their own foreboding personality. The enemy encampment is filled with windmills that are perfect for climbing and observing the area, giving Danny an opportunity to spot enemies and mark them on the map for easier sneaking and killing. The story that follows switches things up and makes its protagonist a hot-shot pilot, and if this is all starting to sound like training for multiplayer, that thought wasn’t completely lost on me while playing. As engaging as many of these missions are, Battlefield 1 starts off with the impression that they just want to show you the ropes, especially when the first tank mission has you capturing and holding positions just as you would on one of the more expansive multiplayer maps. Once it comes into its own, though, this forced tutorial feeling begins to fade. Besides, when you do start playing online you’ll be glad they opted to ease you into the process while weaving a riveting, occasionally heartbreaking yarn. Before we move on to multiplayer, I have to point out one slight disappointment with the narrative. The opening mission set a really high bar for what could have been even more unique than the isolated stories that followed. “Storm of Steel” is a prologue set in 1918 that has players controlling different members of the Harlem Hellfighters in France. The goal is simple: Survive as long as you can manage while defending your position, but if you die, well, that soldier is permanently dead. His name and lifespan will pop up on screen as a brief memorial before transporting you into the perspective of another soldier in the squad. There have been many attempts to drive home the nature of war in the past, but this is hands down the most effective. It ends on a poignantly somber moment—one that shows two confused, young, and hopeless sides of the same coin—before transitioning to the world map and the story selection screen. If these War Stories ever get to be too much, you can always take a break with multiplayer, which I realize is the exact opposite way that works for the majority of players. For most people the online battles are the main course, and now that I’ve spent more time with Battlefield 1 I can see why. First, they’re incredibly easy to just jump right into without any unnecessary preamble. I’m more of a Team Deathmatch kinda guy, so I first tested the waters in that mode, landing right in the middle of an already lopsided firefight. Thankfully, losing is still a valid way to level up your character, because I would be doing plenty of that over the hours that followed. There’s a little something for everyone as far as maps go, and Battlefield 1 has some real doozies. Ballroom Blitz was an immediate favorite of mine. It has some amazingly designed close quarters inside, a courtyard that caters to a variety of strategies, and areas farther out that come into play in interesting ways when experienced in different modes. There’s nothing quite like holing up in the ballroom only to see a tank roll up outside and start wreaking havoc on any unfortunately positioned teammates. I can’t imagine how difficult it must be to balance these maps for both foot soldiers and land and air vehicles, but EA DICE makes it seem like a piece of cake. The response to Battlefield 1 is solid evidence that people are still interested in playing shooters that stick to history and attempt to recreate past battles in both accurate and entertaining ways. Anyone on the fence about this one should do themselves a favor and leap on over, because otherwise you might miss out on one of the best shooters 2016 has to offer. Tags Dice, first-person shooter, Game Reviews, Mark V tank, war games, World War I.